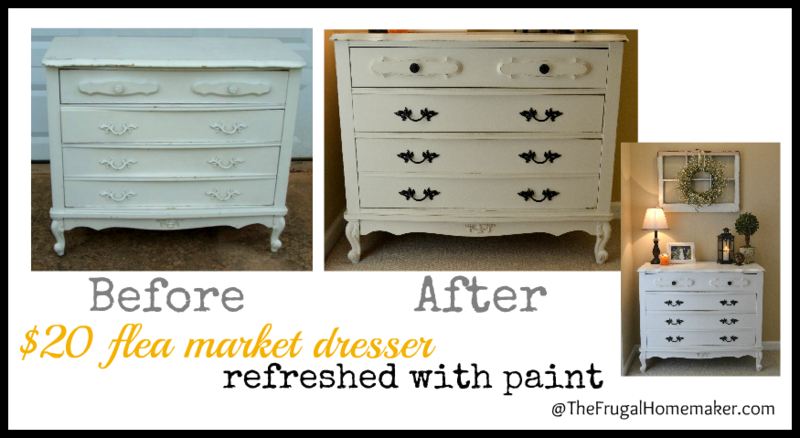 I am so excited to share the first furniture re-do on my blog today! It is actually not MY first piece to do – I have done a coffee table, toy chest, and another dresser, but this is the first official piece I am sharing here with before/after pictures. 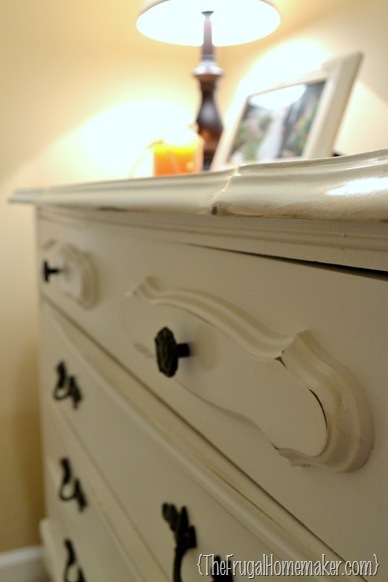 I bought this dresser for $20 from the flea market quite a while ago (uhhh… a little embarrassed when I saw the date on this picture – almost 2 years ago.) Sad to say it has been sitting neglected in the garage, collecting cobwebs since then. I was working out of the house then and just didn’t have time, motivation, or inspiration to tackle it. 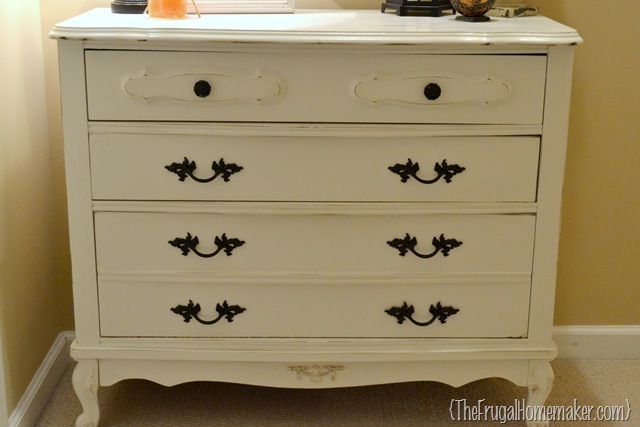 I LOVE French provincial furniture! 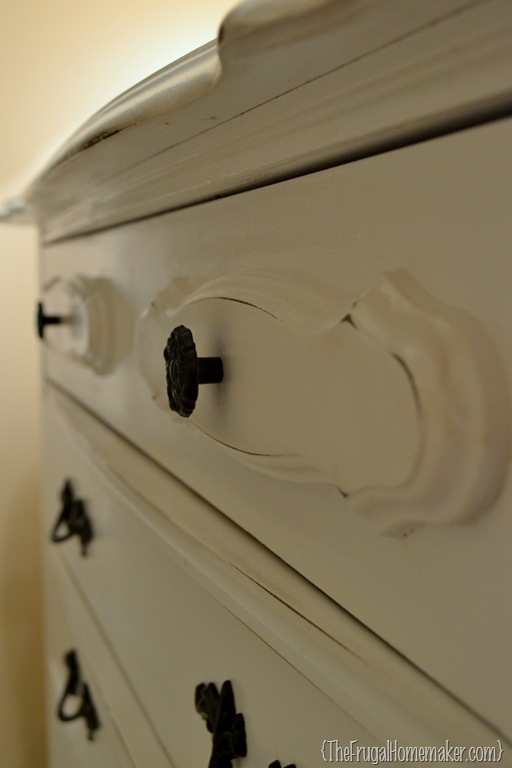 My guest room furniture is French provincial and is the furniture that I grew up using as a child. I love the lines of these pieces, the details, the handles, the curves… And I love the way they turn out in before/after pictures I see on Pinterest and blogs. I had originally wanted to try to sand and stain the top but it wasn’t solid wood so wouldn’t have the wood grain look that I was wanting. So I decided to just paint it white. My husband bought me a paint sprayer last year for my birthday and I have been trying to learn how to use it effectively. 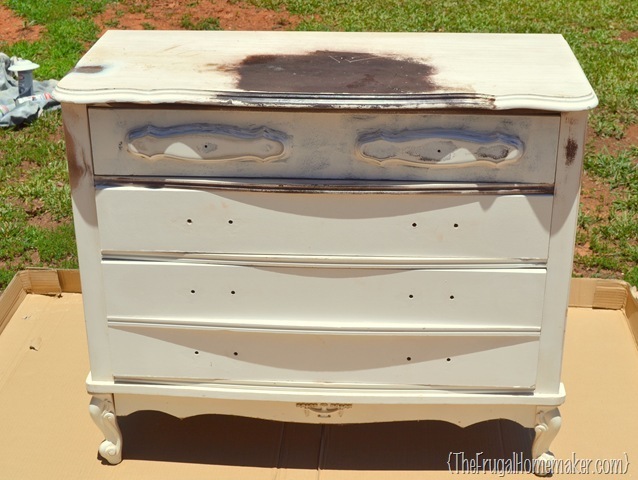 I struggled with the first dresser I did a few weeks ago – it had a rough finish and I had to sand it quite a bit in between coats and afterwards. I used a smaller nozzle and thinned my paint more this time and it worked much better! Still not perfect, but better! Here’s my “paint booth” a few weekends ago! 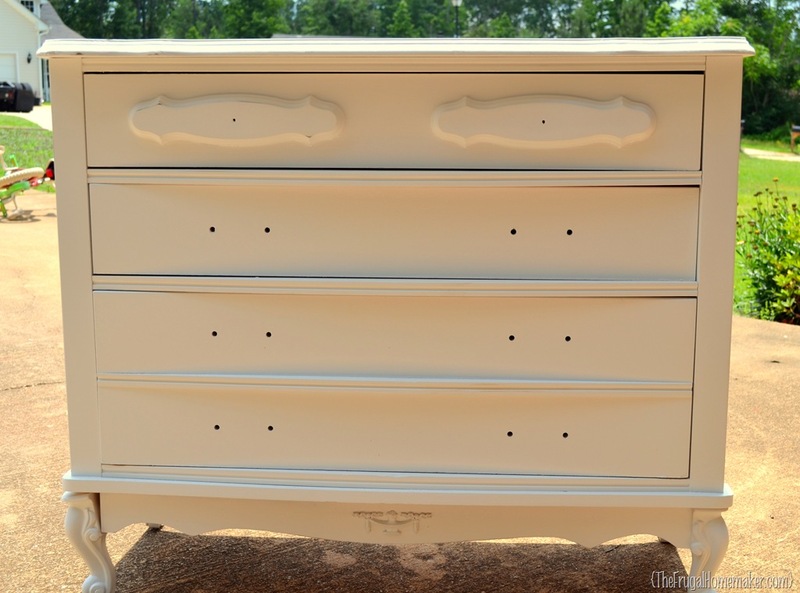 I used Valspar paint and primer in Sawyer White and did 2 coats. I really love this paint! No primer needed as it is in the paint and it goes so far! 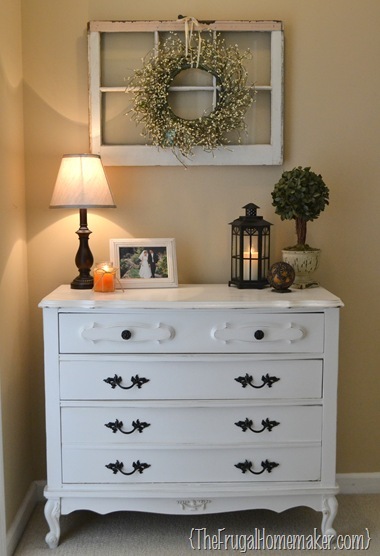 I have painted 2 dressers, plus what you see in this picture and have used about 1/4 of the can. 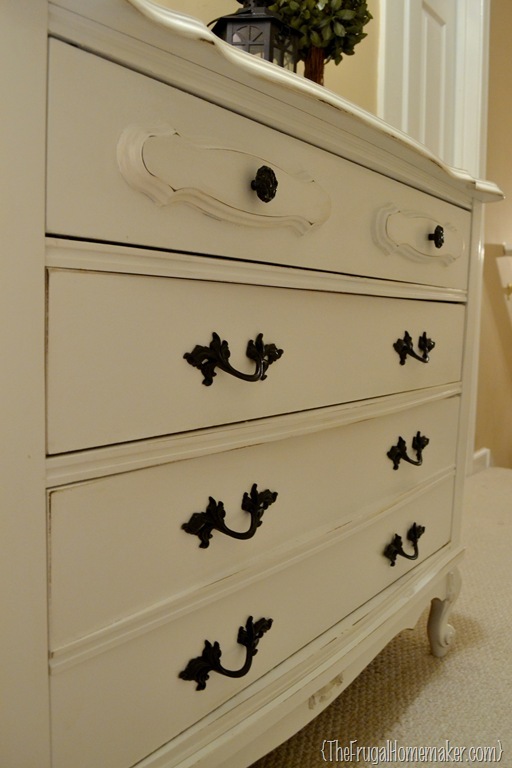 Whoever had owned it before had just painted the whole thing a rough white handles included! While it was drying, I spray painted the handles with primer and then gave them 2 coats of Krylon Oil Rubbed Bronze spray paint. I let it all dry for a few days. Then lightly sanded it smooth and it was ready to be distressed. My nieces were at my house that day I was working on it and of course had tons of questions for me. 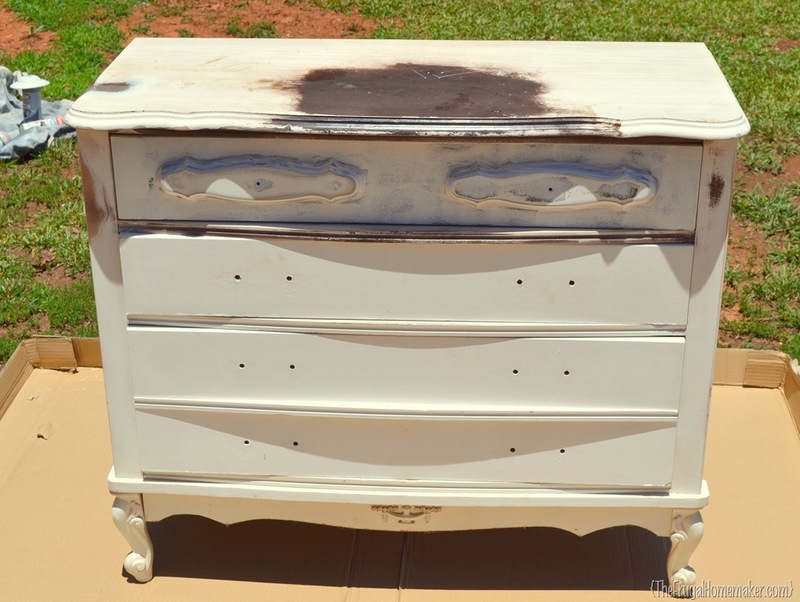 I told my 4 year old niece I was distressing the dresser. She said “Does ‘estressing’ mean messing up the paint you just painted?” Yep, that is pretty much it! 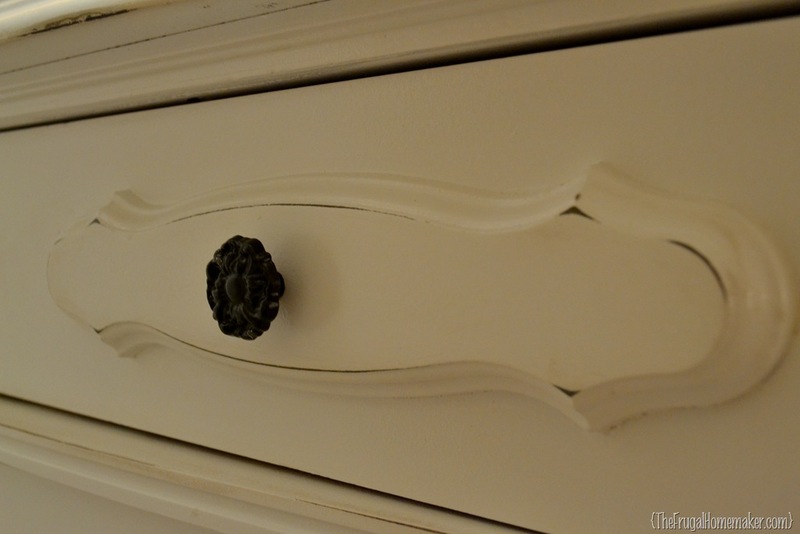 I just lightly distressed the edges of the dresser, the edges of the drawers, and the edges of the decorative piece on the drawer. I like to use my sanding block and I usually use some medium-fine grit sand paper. Since the dresser wasn’t dark wood underneath the white paint, the areas I distressed didn’t stand out that much. So I brushed them with some dark walnut stain and wiped it off immediately. Then I finished with 2 coats of clear poly. Hold on, I am getting to the after. Now it was time to find a place for it in the house. I had originally bought it thinking I would use it in my entryway, but I had already found a larger dresser to go there (that reveal is coming soon too.) 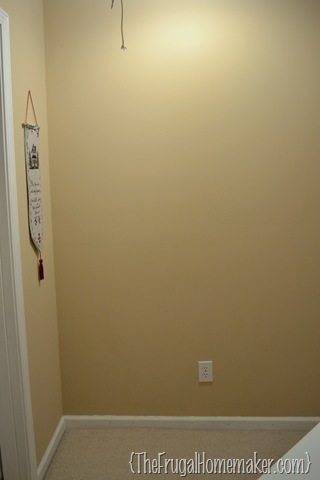 So I decided this one was perfect to go in between the bedrooms at the top of the stairs. I had fun decorating it too! I love the dark handles in contrast with the creamy white. It helps bring out the distressed parts. Most of the décor came from yard sales too! 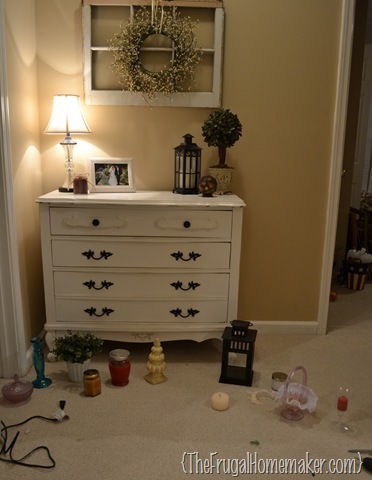 The lamp, candle, and lantern are the only things that are not yard sale finds. 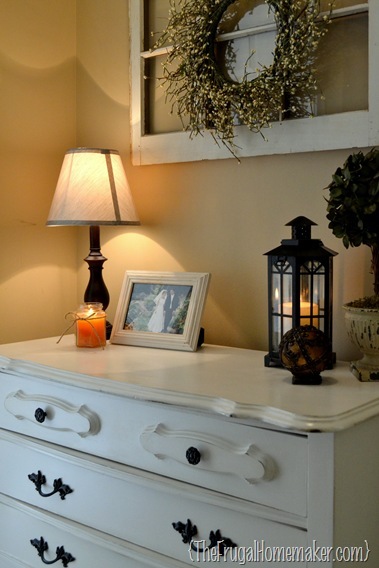 Lamp was 1/2 price at Dollar General – $6.50 for lamp + shade, candle – gift, lantern – part of set from Kirkland’s. I am not sure yet what I will store in there. I may use it for craft supplies, games, and puzzles for my nieces and nephew – they were excited about that when I told them! Or maybe linens, candles, or extra décor. I will definitely put the extra storage space to good use! 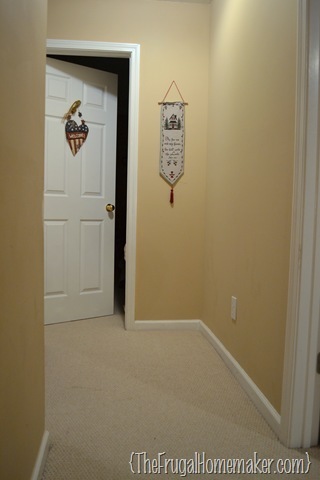 And just so you don’t start thinking my home is just perfectly put together and beautiful all the time… remember the rest of the upstairs is too scary to even show right now. And that matter the whole house is pretty scary right now too as I have projects going in about 3 rooms…. and I am hosting a party on Friday night and Father’s Day lunch on Sunday. That’s the way it is most of the time around here – I work best under pressure! And this is what this space looked like minutes before taking the pictures above. Random décor pulled out from everywhere trying to find what would work. 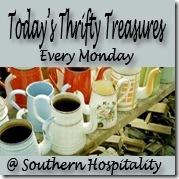 So keep your eyes peeled at yard sales, flea markets, and even the side of the road! You never know what treasure you might find. And with a little paint and some elbow grease you can have a piece you treasure in your home! When you’re done with your house can you just come up here for a while and do mine? It needs so much work, but I can never seem to get things from my head into real life. 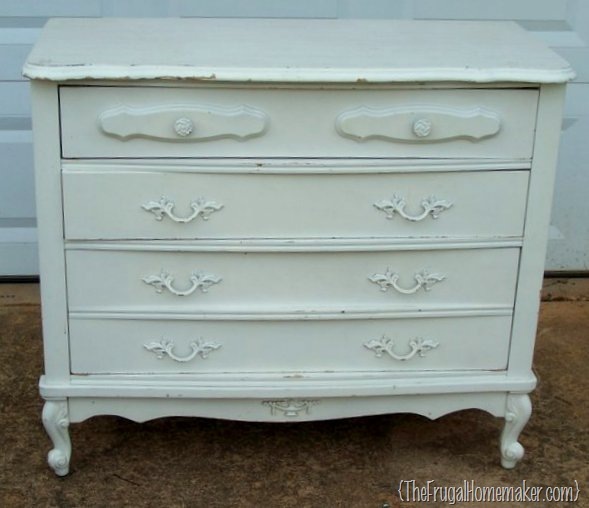 I totally can’t picture the “after” when I see all the junk at yard sales, so I end up passing over lots of things that would probably end up looking nice. Love it! Its pretty and will give more storage! What a steal! Looks great! 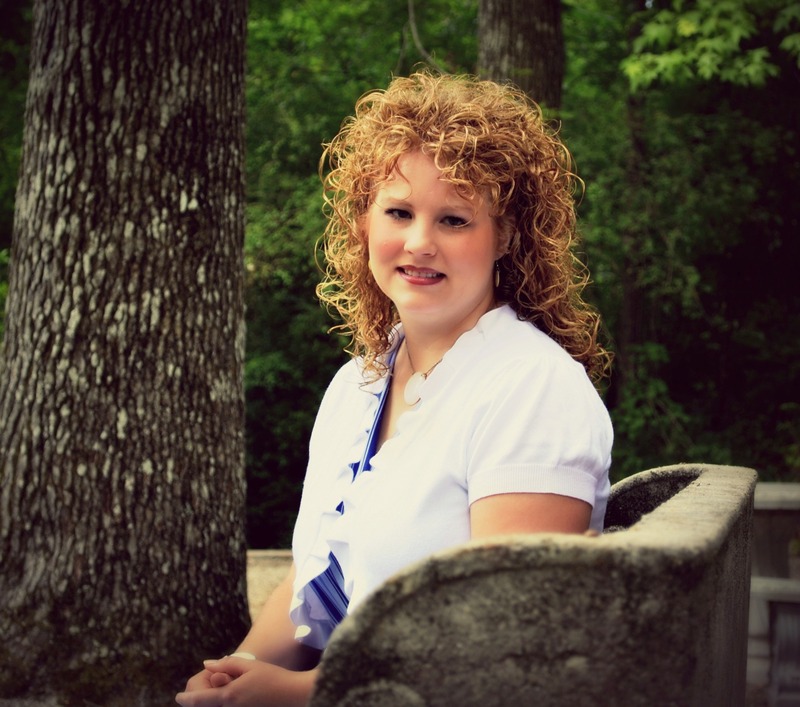 Renee@ Living Laughing & Loving recently posted..What I’m taking to Haven! Oh, it looks gorgeous and I love the way you decorated it. Turned out beautifully and it is just perfect for the space! Know what you mean about having multiple projects going on at once! Nothing like planning to entertain to get projects done! Thanks so much for linking on Busy Monday at A Pinch of Joy! Hope to see you again soon! 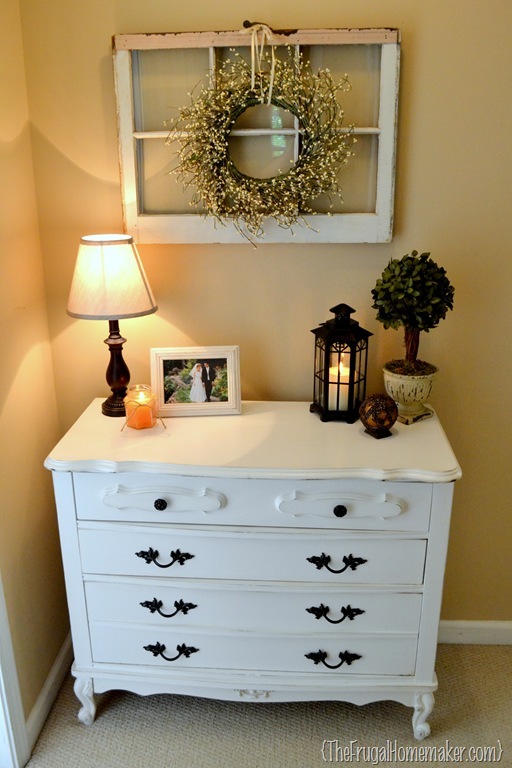 Wow, this looks great and I love where you placed the dresser! Such a cozy spot! I’m inspired! awww… thanks, Amanda! I actually intended to use it as an entry way table but then I found a bigger one (which I will reveal soon). But I am really glad it didn’t end up working cause I like this spot too. It looks beautiful! I am looking for a dresser like this too! This is gorgeous! I love the slightly distressed look, and never would have thought of wiping off walnut stain. Great technique! Great Makeover, Christina! Love it! Would you consider selling it. MY daughter has a matching one and ive been looking for another one. Stopping by from Before and After.. Beautiful job! this is so cute and I like that you stayed with classic white. Great job and thanks for sharing! I am (re) doing a french provincial right now for my daughters room, I got it at a flea market and someone had painted it with acryclic in yellow, green and pink. Its a piece of work. I just had to take a look at yours. Its looks so crisp and clean! I wish I had a paint sprayer:) Great job! 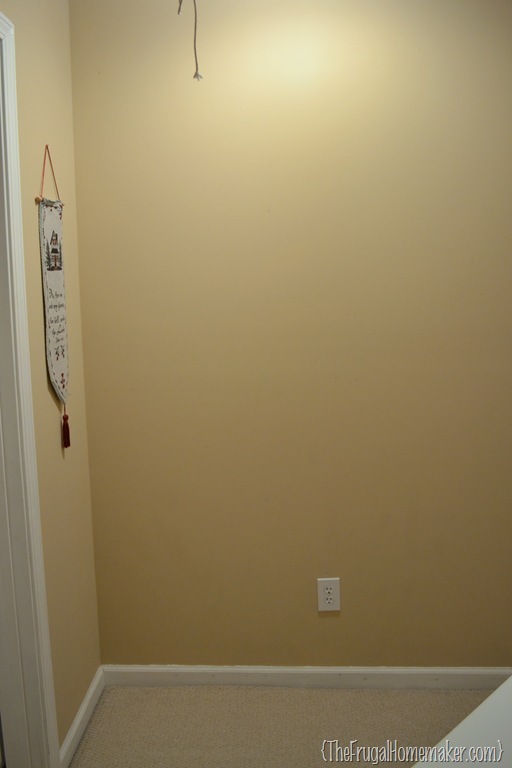 Britt @ Creating Space for Five recently posted..Lamp Switch, and Book Storage! 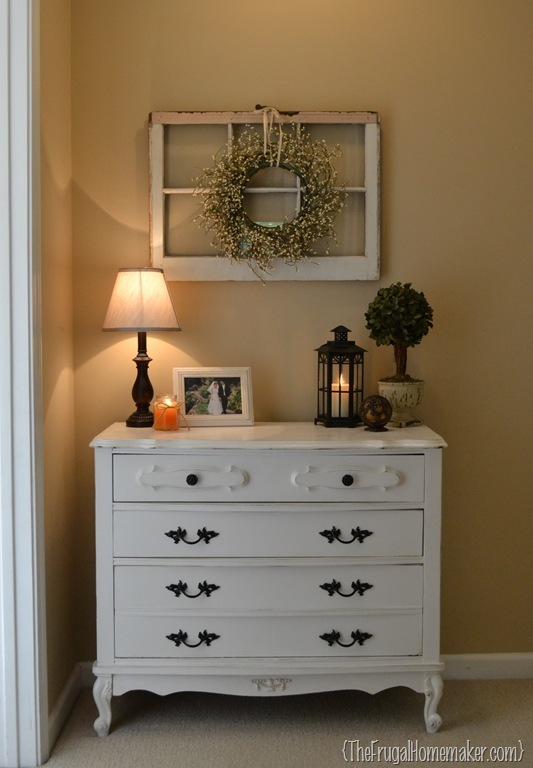 I love your dresser makeover. 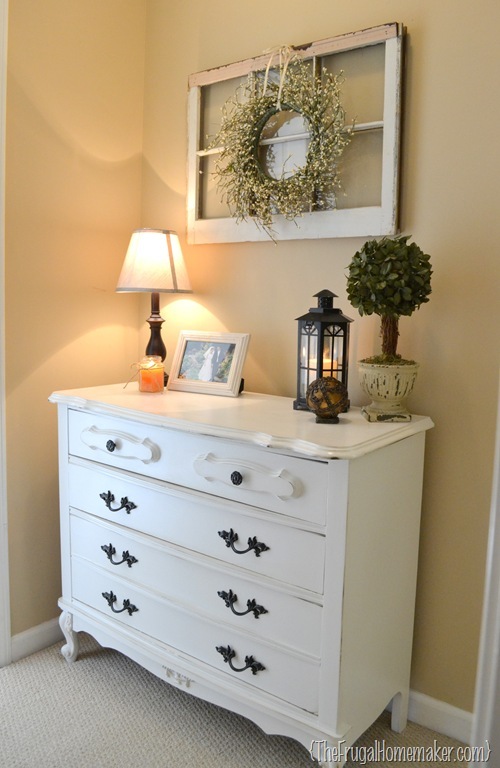 I have a similar dresser I am going to makeover also. 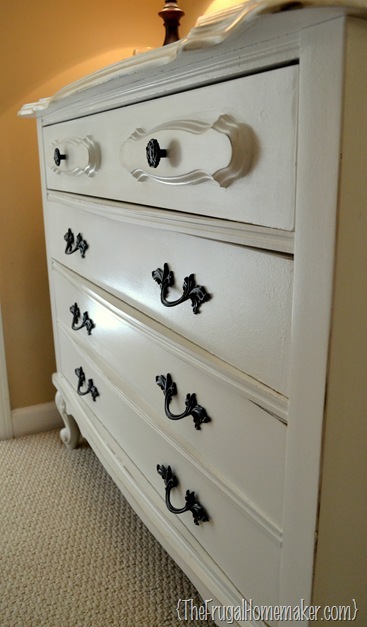 I was wondering if you used the original drawer handles and painted them or did you add all new handles and knobs? couple of questions about the window… Does it still have the glass and what did you use to hang it on the wall? Nice job! I would really love to find a window like that but am thinking to have to buy one is pretty pricy. Ok. ..I do LOVE the dresser and the decorating…but PLEASE tell me the color of your walls.Such a perfect color to accent all your hard work!